In 2007, I went to a Jewish friend’s tree-trimming party, got slightly drunk, came home, slept for a few hours and took the GREs the next morning. 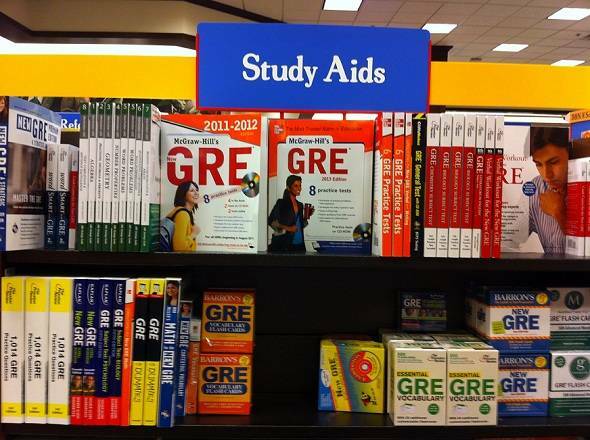 (For those of your reading from across the pond, GRE stands for Graduate Record Exam, the bane of my existence and the existence of all academically inclined 20-somethings across the country). Suffice it say, my scores weren’t exactly off the charts. But it didn’t matter: I ended up going to grad school in the UK where nobody cared about my ability to solve for X. 2007, unfortunately, was six years ago. And GRE scores expire after five years. This means that I’ll be taking them again this fall. To say that I am “unhappy” about this would be an understatement. To say that I am “angry” about this would also be an understatement. I am, in fact, livid about this. And not just because I was stuck lugging my “GRE for Dummies” around the Bahamas, and not just because the darn test costs $180 before you tack on the cost of the test prep materials (which range from $29.99 on the low end and on up into the triple or even quadruple digits on the I-cannot-afford-end). It’s the principle. My students and I spent nearly an entire class period last semester discussing how the education system is biased in the favor of the upper class and even though a bunch of them starting whining about affirmative action and “all those black moms with like three kids who take our scholarships,” I eventually managed to get the conversation back on track. We had what turned out to be one of the most interesting discussions of the entire semester. But now I find myself in the not-so-unique position of having to play the game in order to beat the system. It doesn’t matter that I already have a graduate degree. Or that I’ve already taken the exam. I could write 10 blog posts. I could inform the college girls seated next to me that the first “r” in “library” is not actually silent. I could watch 12 ethnographic films. I could walk to the art museum, spend eight hours studying useful things, and walk home. The next day, I could walk to the archaeology museum and do the same thing. I could read approximately 16 back issues of Expedition magazine. I could continue harassing the dean of the liberal arts department about the shortcomings of the designated textbook and get my students some proper reading materials. I could make cookies. Lots of cookies. I could finish writing my novel. But those vocabulary flash cards aren’t going to write themselves. Best of luck with your GRE!!!! I think it is so unfair having to pay to take a test. It’s like I’m paying you to torture me with stressful testing. Not cool. I had to take the PA Teaching Certification test which was a pain, but I passed it — only to find out that no one will hire a teacher without experience. So that went out the window. The educational system IS bias. I agree. I shouldn’t be up to my eyeballs in debt because throughout grade school I was told that I needed a degree if I wanted to do anything with my life. Got the degree and ended up getting a job that I could have done without a degree….oh well. Continuing Ed for massage is for my field and I do think its a good idea, just that the cost for like a 4-8 hour course can sometimes be up to $500 or so! 😦 Massage continuing education can be (and is) super pricey so I’m always on the lookout for good deals and learning something new that interests me and I can use with my massages. It’s just frustrating that the education I’m interested in is in that very pricey range for little amount of hours and I need it to add up to a certain amount to get my license. At least now, they no longer have the “A, B, C, D, E, and F are sitting on a bench” questions, the ones where they wanted to know whom A can be seated beside if B cannot sit beside C unless D is sitting between E and F, and all that fun stuff. The word lists in the study guides are gold. Learns them! A PhD won’t make you a better teacher. But it is the paper that will let you be paid and treated as though you are (vs adjuncting)! In all my schooling I have had very little pedagogy training, and much of it I searched out myself. Rock those GREs though and count it one hoop down! good luck! I took 15 years between degrees, so I got to take that wonderful test twice as well. I think we’re buring the lead here. Tree trimming party?!!! I don’t envy you at all. When I took the GMAT, it had been over ten years since my last math class. It was torture. I won’t be getting a PhD. I can’t afford it. My student loans are already high enough that I might end up living with my children in my old age. I don’t envy you at all. When I took the GMAT, it had been over ten years since my last math class. It was torture. I won’t be getting a PhD. I can’t afford it. My student loans are already high enough that I may never be able to buy a house and might end up living with my children in my old age.